There were forty Tekke clans at the Merv Oasis in 1882 subdivided into two main groups, the Otomish and the Hotomish, by a disecting river according to Edmund O’Donovan. He wrote a very important book published in 1882 called The Merv Oasis in which he observed that each clan had one or more Khans. The term Khan may have primarily applied to very successful individuals in each clan, therefore every generation of the Tekke tribe produced between perhaps 40 and 120 Tekke main carpets and a corresponding number of Tekke small rugs for high ranking males or Khans. Considering Timurid miniatures as archetypal, as Robert Pinner proposed in “Turkoman Studies One”, one might suppose Tekke Khans would have placed their small personal rugs atop the perhaps communal main carpets at important communal gatherings. What constitutes the traditional Tekke main carpet tradition or aesthetic? After thirty five years of study I have concluded that the traditional Tekke main carpet employs basic laws of perception which magnify the Khan while minimizing his supplicants. This is done by making the gulls at one end larger than those at the other end. The Khan sat at the end with the relatively smaller gulls, making him seem relatively larger. The initial row of larger main gulls is often associated with minor gulls different from the rest. I suspect this indicated something about the Khan’s or clan’s linage to knowledgeable supplicants. Additionally, in the oldest Tekke examples, one sees the use of asymmetry around each main gull’s horizontal axis, producing a subconsciously recognizable three dimensionality. Upon approaching the Khan one would subconsciously or perhaps even consciously perceive that the Khan was floating in the space defined by those three dimensionally drawn gulls: on a flying carpet perhaps? I believe that native Turkman weavers, working in the traditional matriarchal extended family milieu, participated in a communal subconscious pool of symbolic relationships and meanings. Analyzing truly traditional and historical Tekke weavings with regard to their symbolic content has become a high priority for me. 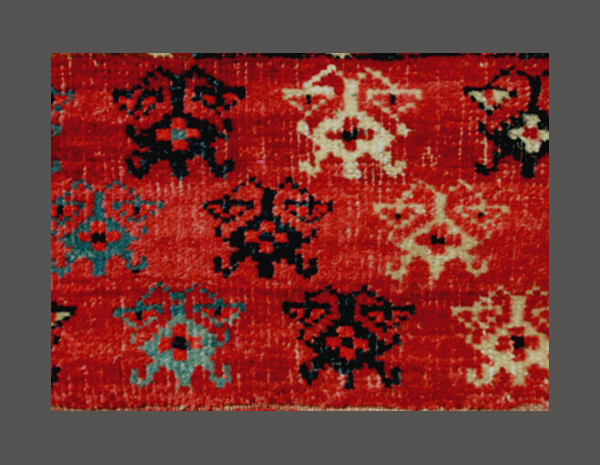 The use of a large plain weave elem in traditional Tekke main carpets finds resonance in the larger congregations of Tekke clans, where this one fundamental similarity served to underscore their mutual affiliations. The borders of Tekke main carpets perhaps have a secret language all their own, but I have no insight into this aspect of Tekke rugs. Tekke field designs are stable across hundreds of years of known reference examples. I propose that the aesthetic of traditional small Tekke rugs parallels that of traditional Tekke main carpets. One immediate difference is the presence of elems on the small rugs. 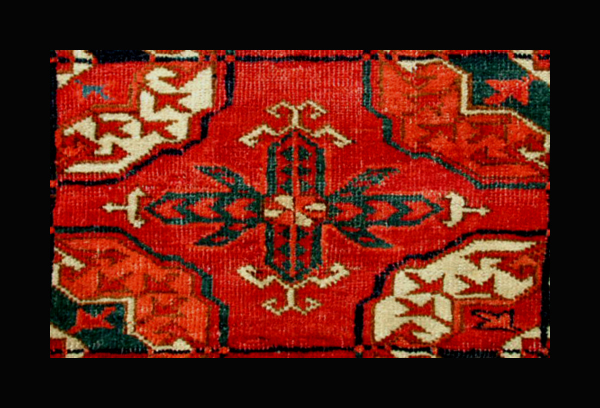 Picture # 1 is an exemplary example of the traditional Tekke small rug with main carpet gulls. The elems are both so arranged that any person sitting on this rug sees an elem full of flowers, as if from horseback, moving diagonally across his path. The “movement” is created by the careful placement and coloring of the flowers in a diagonal array. Any supplicant approaching a Khan sitting on such a rug would be presented with an elem full of eyes and zoomorphic associations; see detail #3. The double meaning of the flowers when viewed from opposite sides is typical of traditional Turkman iconography. Though the number of gulls is only twelve the traditional asymmetric arrangement of gulls according to size is quite obvious. The six gulls at each end are larger than the six gulls in the center. A man sitting on the center of this rug would be magnified by the arrangement and disproportion of these gulls. Imagine approaching a Tekke Khan sitting on this rug. His silks would obscure most of the central main gulls, but not all of them. The eye of the supplicant would subconsciously measure the size of the first row of gulls and assume that the size of the partially hidden gulls were of the same size. The supplicant would subconsciously understand that the gulls partially hidden underneath the Khan were actually smaller and therefore compensate for this subconscious discrepancy by magnifying the size of the Khan. Combine this subtle sub-conscious inter-play with asymmetrically drawn major gulls that seem three dimensional and the Khan is perceived not only as larger than life but floating in space as well. The minor gulls are done exactly as they are on Tekke torbas. The chemche minor gull, detail #2, is a complex layered image incorporating several elements depicting the Zen of archery from horseback. In my archeology of the Turkman psyche I see the central rosette in the chemche gull as depicting the critical action of drawing back the nock to a corner of the mouth then releasing the arrow in a smooth practiced motion directly into the heart of the target. I see the chemche gull as dimensionally compressed, from four dimensions to three dimensions represented in the basically two dimensional medium of weaving. The fairly simple process of representing three dimensional objects in a two dimensional medium requires the use of visual tricks reinforcing a specific perspective. The method of reducing a four dimensional process into lower dimensions requires the use of shared subconscious experiences and this can only occur through many generations of practice. The absolute requirement for continuity is what makes Turkman weavings so valuable. This chemche gull implies the complete action of drawing and shooting a bow and arrow. This complex process is reduced from a sequence projected through time in the mind. The action of shooting a bow and arrow reassembles into an ensemble of components disconnected from each other yet mysteriously arranged into a didactic motif. Let’s look through my analytical lens at the vertical components of chemche gulls. Might their vertical components represent the body of a bow looked at from the front? The vertical ends represent the recurved nature of their bows, which gave them tremendous power. This power in a very short bow ideal for mounted archery revolutionized their existence making them a force to be reckoned with. The vertical ends are often seemingly possessed of great power respecting the great advancement this type of bow brought to the Turkman warrior. The diagonals of the chemche gull meeting at the rosette represent the drawn bow string. The fact two strings are represented is superfluous. The paired horizontal components of chemche gulls represent arrows flying from the bow. These horizontally aligned ‘arrows’ are always detailed with outward pointing chevrons implying movement. I believe the small “bow with arrow” motifs to the left and right of the horizontal visually accelerating arrows of the chemche gulls amounts to the proof of my hypothesis. These small motifs serve to reinforce the image and its understanding. The next time you stand in front of a truly traditional Tekke torba, imagine the main gulls indicate the weaving’s identity and to some extent its’ linage. Now moving your eyes to the chemche gulls, imagine the intent of the torba’s original owner was to make you feel as if you were looking right down the shaft of an arrow aimed right at your face! Doesn’t this image correspond to our knowledge of who and what the Turkman people were, relative to we city dwellers, as described by Edmond O’Donovan in the Merv Oasis, first published in 1882? Small Tekke rugs were made in large numbers during the latter 19th century but truly old ones, like the example used to illustrate this article, are extremely rare. The Tekke rug used for this article has a rich purplish red ground color and a very fine weave, comparable to that of common Tekke torbas. The secondary colors are brilliant red, apricot, green, dark blue, light blue, yellow, brown, and white. The green is strong and the same color front and back. 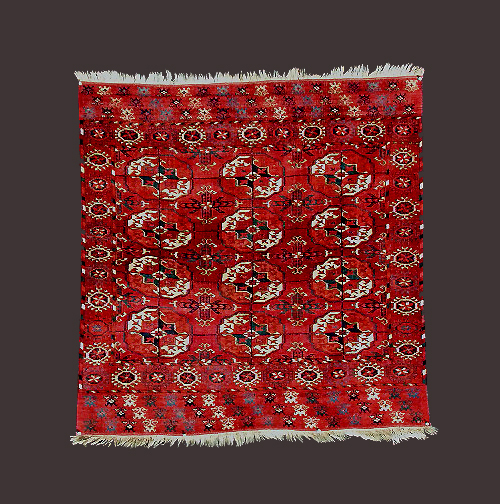 The coloring, fine weave, and iconographic integrity of this small rug likely places its manufacture to the early 19th century, a period of renewed Tekke strength and the very last decades of traditional Tekke life. Traditional Tekke life, like that of horse mounted Indians in the American West, came to a gradual end as railroad tracks penetrated deeper and deeper into their rich pastoral lands.